Bangkok Smile MALO CLINIC is the one and only internationally accredited dental company in Thailand for both scopes of DENTAL CLINIC SERVICES and DENTAL LABORATORY (ISO 9001: 2015). Thus, you can be assured that Bangkok Smile MALO CLINIC will continuously provide the highest quality of dental works and the utmost dental services ever. Both world-wide certifications assure that Bangkok Smile Dental Group continuously provides the excellence service in dental clinic and dental lab provision together with the expertise in dentistry to all patients. What is the ISO 9001 : 2015? The ISO 9001 standard was developed by the International Organization for Standardization (ISO). The rigorous ISO 9001 requirements are designed to help organizations create and maintain processes necessary to produce quality products and services. We must undergo external audits twice each year, and a full recertification audit every three years, to ensure ISO compliance. Bureau Veritas, founded in 1828, ranks as the world's second largest group in conformity assessment and certification services in the fields of quality, health and safety, environment, and social responsibility ("QHSE") and the world leader in QHSE services not including raw materials inspection. Bureau Veritas is recognized and accredited for major national and international organizations. It is present in 140 countries through a network of 900 offices and laboratories and It has more than 39,000 employees and a client base of more than 370,000. Bureau Veritas Certification certify that our Management System has been audited and found to be in accordance with the requirement so the management system ISO 9001:2015 as our services. By our ISO 9001:2015 certified dental Lab, ProDent Inter Dental Lab Co.,Ltd., all crowns, bridges, veneers and dental implants are tailor-made for all of our dental clinics; 3 clinics in Bangkok and 3 clinics in Phuket. 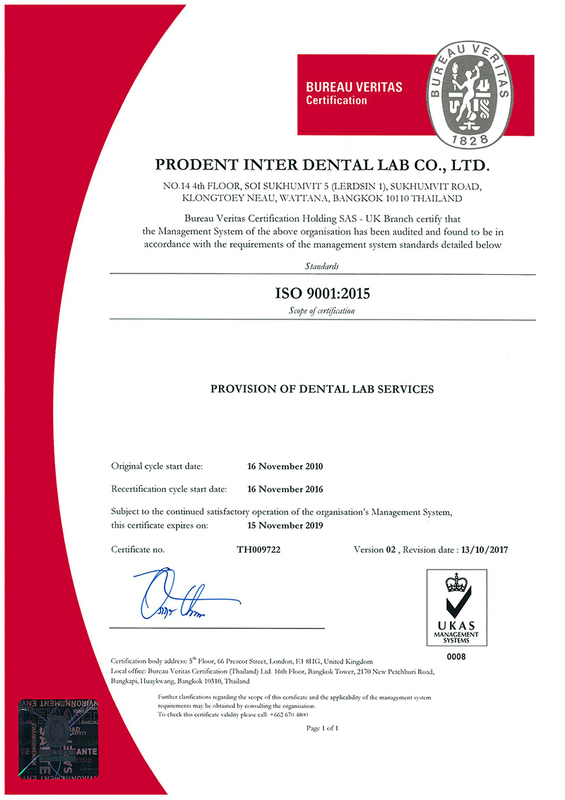 The management system of Prodent Inter Dental Lab Co., Ltd. is certified on IS0 9001:2015 quality standard as “PROVISION OF DENTAL LAB SERVICES”. Management: The management of dental lab is under the total quality management (“TQM”) methodology and implementation. That includes total work flow of dental work manufacturing, planning, processing, controlling, and evaluating. Inspection: All materials, work-in-process, and finished dental works are inspected in every process of manufacturing by the professional technicians at 100% inspection and under the quality control standard. Delivery: The finished dental works from our dental lab are scheduled at in-time delivery to our Bangkok and Phuket clinics. Speedy Service: Prodent Inter Dental Lab Co., Ltd. also provides the speedy services to our Bangkok and Phuket clinics. This service makes our patients assured that all dental treatments will be completely done even in the tight-scheduled trip. Trip Management: The certified management system of our dental lab makes us confident in all dental treatment plans to our patients who need the effective treatment plan on their dental trip itineraries to Thailand. The dental treatments are provided to each international patient within trip completely. 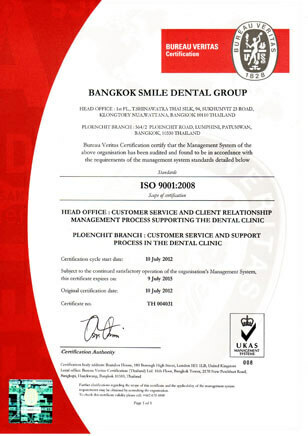 The management system of Bangkok Smile Dental Group: Head Office and Bangkok Smile Dental Clinic, Ploenchit branch is certified on IS0 9001:2015 quality standard. We practice the professional protocol and excel the system in responding incoming inquires in a timely manner. Important information such as dental treatments, treatment expenses, period of time needed and accommodations are neatly provided via email, prior to patient’s departure. Through BSDG’s in-house Intelligence Point of Service software (IPOS), patient’s information; appointments, x-ray, dental records, including any special requests are recorded and transferred systematically from head office to dental clinic. We work on the same platform, from head office to clinic, therefore, each patient’s unique requirements are treated properly from email to dental examination room. We are ready to be at your service even after you have done the treatment with us. In case, any questions that needs to talk to your dentist, we are at your disposal to contact the dentist for you. We guarantee the quality of every dental work maximum 3 years and take responsibilities of any unforeseen incidents free of charge, in regard to the smile guarantee. As a professional, our sterilization system is second to none. Routinely, we practice the hospital standards and sterilization techniques. Dental instruments and dental examination set are one time used and due to undergone full sterilization process. The standard is indicated by chemical integrator 3M Sterigage, Class 5. Dental instruments are stream autoclaved, packed, date produced and systematically stored and ready to be in service again. All dental instruments are controlled and under inspection every 4 months by technicians in order to assure daily smooth operations and hygiene. The guarantee covers our time and the cost of any necessary materials. It does not cover the cost of travel, accommodation nor any consequential losses that may be incurred.